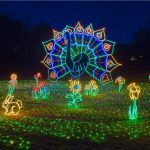 The largest drive-through light show in the Midlands, Saluda Shoals Park provides a magnificent holiday experience for the whole family! The park sparkles in over 1 million lights and 400 different animated light displays. The fun doesn’t stop there! The park provides a variety of even more activities: a laser light show, tube slide, ice skating, arts and crafts, roasting marshmallows, and more! Exclusively on Dec. 9-23, the whole family can visit with Santa and get professional photos! The park is located in Columbia, SC off of interstate 26 at 6071 St. Andrews Road. The cost for the light show admission is $15 for cars, $25 for vans, and $40 for buses. The light display will be open for visitors starting November 23 until December 31 from 6:00-10:00pm. Start a new family tradition and celebrate Christmas and the holidays with your community!